I hope you are all doing well and are having a great week so far! Today has not been the smoothest so I thought I would seek refuge and write up a new post for you all. 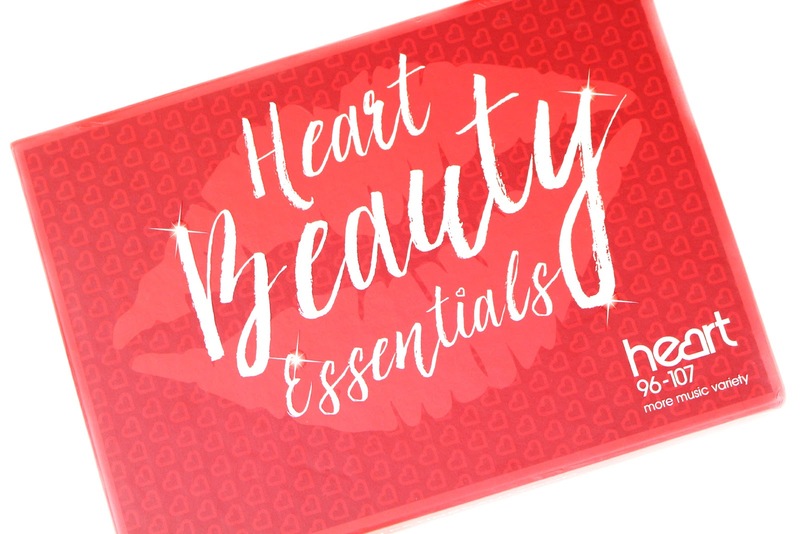 I thought today I would bring you the Heart Beauty Essentials beauty box by Latest in Beauty and I think you are going to really love it! 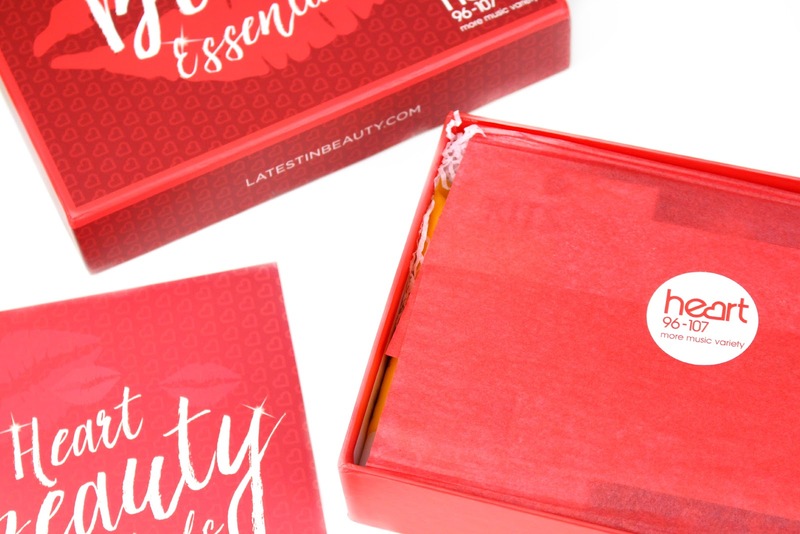 A little while ago I reviewed the Glamour Summer Edit beauty box so when this gorgeous new box of goodies landed on my doorstep I could not wait to dive in and share it with you all. I really love how much effort and thought goes into every box and just look how lovely this edition looks! 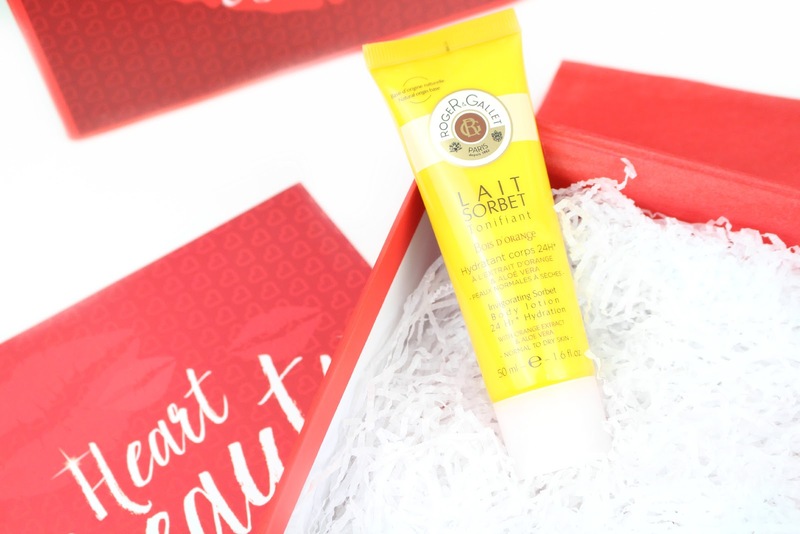 The Heart Beauty Team have stuffed this box full to the brim so it is bursting with gorgeous, skin quenching beauty buys, beauty hero products and some new discoveries too! 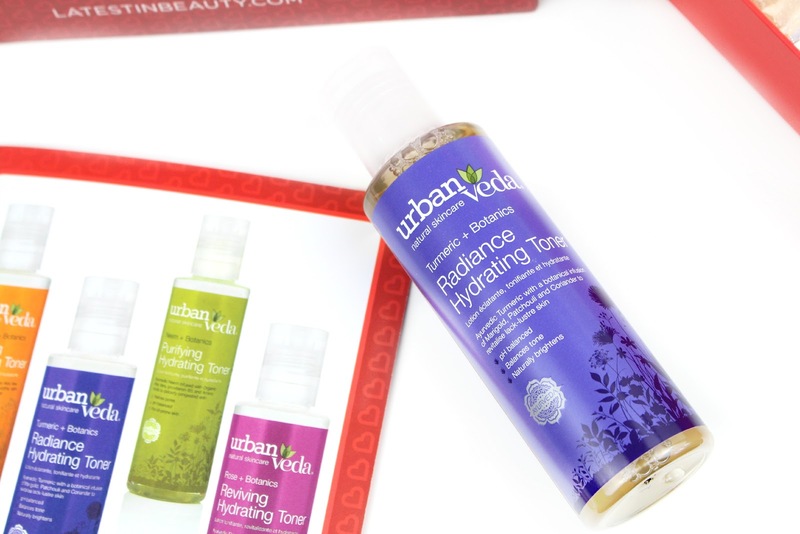 I have received an Urban Veda product in a different box previously so this brand was not completely new to me, however, it is not one I am familiar with. This toner is naturally formulated to Ayurvedic principles (a historical alternative to medicine) to tone, hydrate and revitalise skin. The formulation is enriched with a brightening infusion of botanical and superfruit extracts to impart a luminosity to skin, helping to maintain natural pH balance and naturally brighten, balance and even skin tone for an all-over glow. I love that it is a natural product and after using it a few times I know it reacts with my skin well...however, the only thing I am not 100% sure about is the scent. Obviously, being a natural product the scent is a little more potent and it takes some getting used to. I am a huge fan of body lotion, so when I saw this in the box I was over the moon...plus, the fact that the scent was a refreshing orange sold me even more - it'll help you hold onto summer for a little bit longer! This body lotion is enriched with a cocktail of naturally derived oils, aloe vera and citron extract that work together to moisturise and soften the skin for lasting hydration. The formulation is really light that melts into a water-like texture and I am really enjoying using this product straight out of the shower or bath as it absorbed almost instantly leaving super soft skin in its place. The next product within the box is one from a brand called Bloom and Blossom and this is a completely new brand to me. This is their 99% naturally derived bath and shower gel that is formulated with a sulphate-free foaming base to gently cleanse all skin types. It is packed full of vitamin E and organic cucumber extract and is gentle enough for the whole family to use. To be honest, there is nothing super wow about this product as it is a simple yet effective body wash...however, I will let you know how I feel after trying out a few other products from the line. 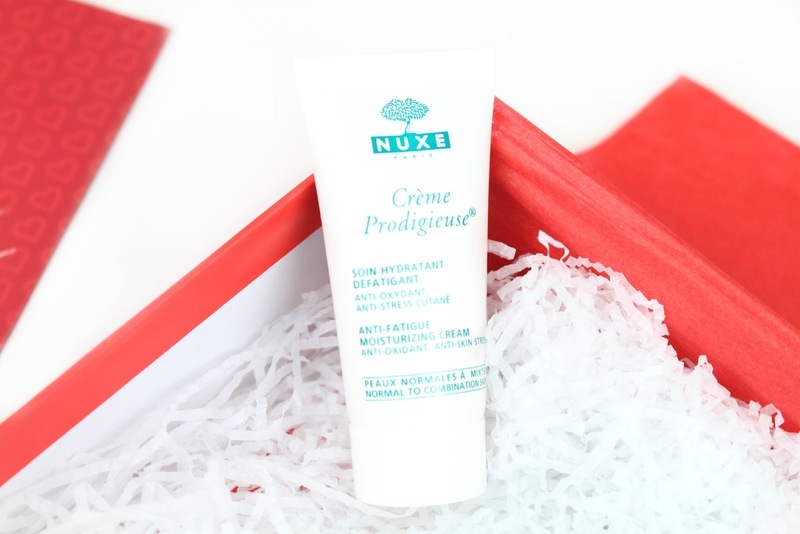 Nuxe is a brand I have seen and heard a lot about throughout the blogging community and I have wanted to try it out for the longest time. This face cream with precious Blue Everlasting Flower extract moisturises, revives and protects skin from oxidative stress. You receive a great deluxe sample size that will give you enough time to see whether it works for your skin type. So far I am really enjoying it and I can't wait to try out some more products from the brand. 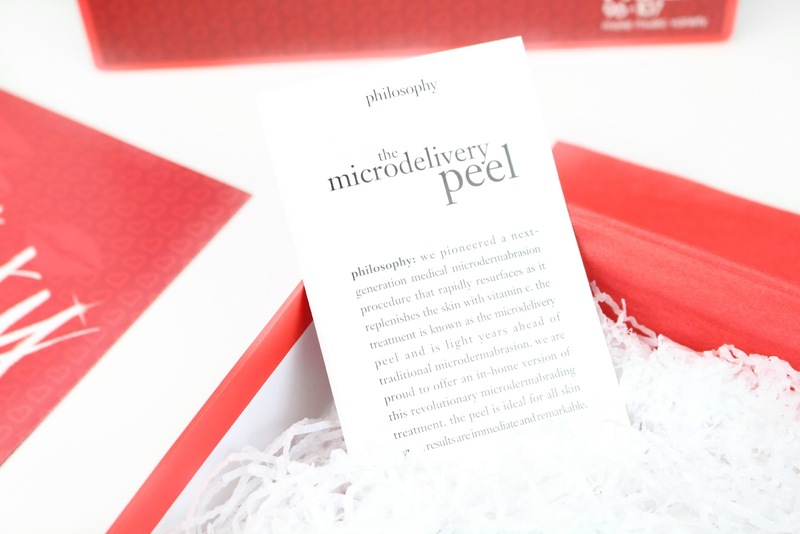 Philosophy is a brand I know and love so I was excited to see it featured within this box. Yes, this product is in a foil packet, however, do not be fooled - this is a great product! Philosophy believes that regular peeling is a critical step to radiant and healthy looking skin. This is an at-home weekly two-step peel that includes vitamin c peptide crystals and lactic salicylic acid activating gel. The formulation works together to resurface and rejuvenate sun damaged, hyperpigmented and ageing skin. I really like the sound of this product - it is one of the fancy products and techniques you would expect in a spa, however, you can do it yourself from the comfort of your own home! Fabulous! 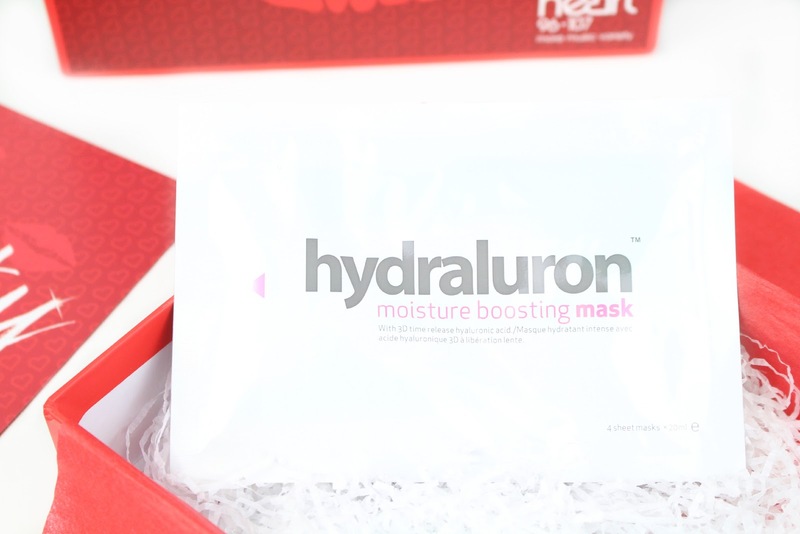 The Indeed Labs Hydraluron range is something I have used before and absolutely love. When I saw that a moisture mask was featured in this box I was over the moon because I have always wanted to give one a try! These unique masks have a 3D enzyme structure which allows up to 24 hours of moisture that penetrates deeper into the skin - ultimately this means softer, smoother, healthier-looking skin that glows! I haven't actually used this yet as I am saving it for my upcoming trip to New York. I am planning on using it after my flight so I will let you know how I get on! 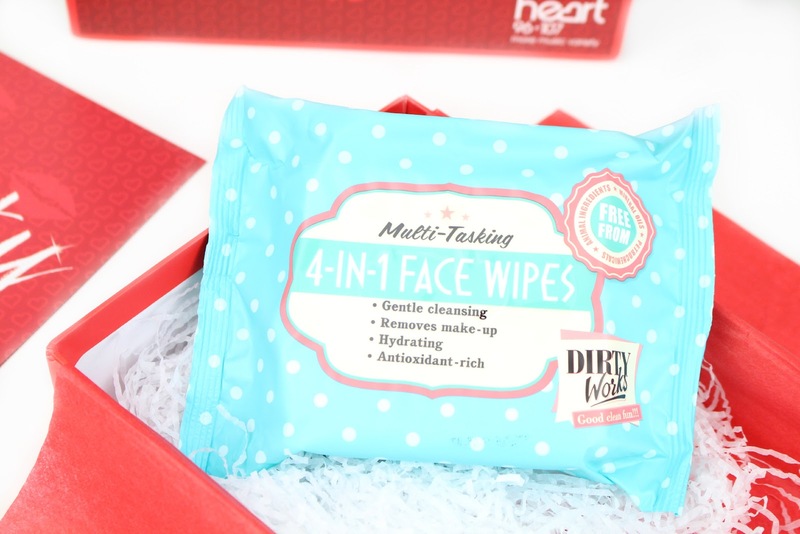 I know not everyone likes using facial wipes within their skincare routine but I really enjoy using them. I like incorporating them into my routine to remove as much makeup as possible before stepping into my skincare products or to help any makeup mishaps etc. Dirty Works is a brand I know and I enjoy - they are super affordable and their product line is fabulous. I love how the formulation includes soothing marshmallow and how they are free from irritants like SLS, mineral oils, petrochemicals, alcohol and aminal ingredients. I have used a few of these already and they are definitely going straight onto my repurchase list - I am planning on taking the remainder to New York with me as I feel they would be perfect to use whilst traveling! I can't remember the last time I had bare nails - I just love nail polish! When I saw that this nail polish was featured within the box I was intrigued to know more. 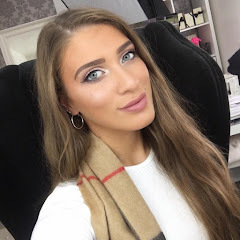 The LOLA range is completely new to me, however, I really like how they have been formulated with Expert Gell III technology which ensure you have a high gloss and resistant wear every time. This electric purple shade is also perfect for the autumn / winter time and you could even jazz it up slightly with a glitter polish on your accent finger for the upcoming party season. I think we all need to take a moment to appreciate how cute these look! I love these types of hair ties and I find they last so much longer with my super long and thick hair. 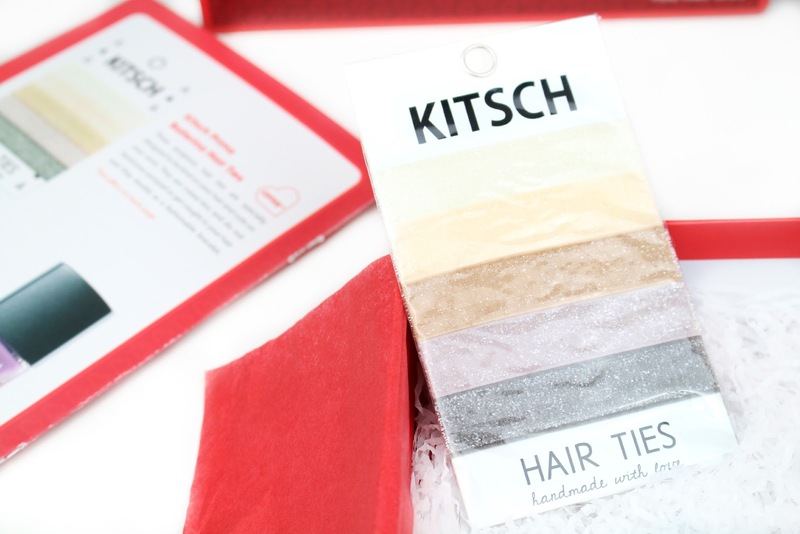 These gorgeous hair ties are specially designed to be kind on your hair and cute on your wrist. They are crease-less (yay!) and do not bend your ponytail or snag and get caught in your hair. I always wear spare hair ties on my wrist throughout the day so I am looking forward to swapping them out for these to see how they work with my hair. 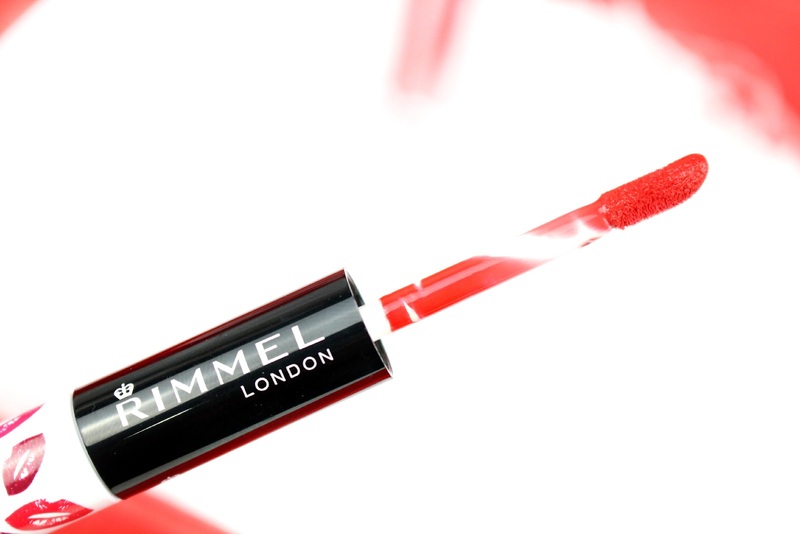 The final product within the box is this gorgeous Rimmel London Provocalips in this gorgeous post box red shade! 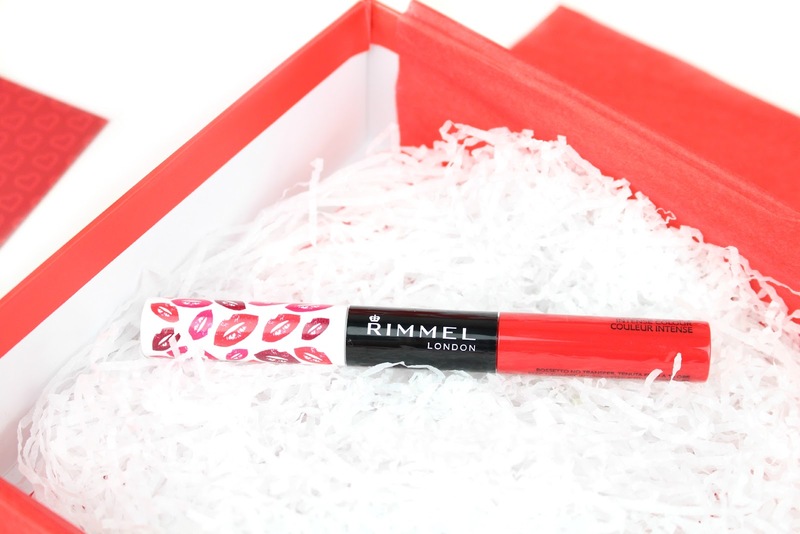 When I first saw this product within the box I was over the moon because firstly, even though I love wearing red lip products all year round, it just screamed Christmas! (who else is excited for Christmas?!) Secondly, it matches the box itself haha. I remember swatching the Provocalips line in Boots when they first launched and I was completely blown away by the staying power - it took some real elbow grease to remove the swatch which means the wear time of these are going to be incredible! Overall, I was completely over the moon with this box and I am so looking forward to seeing what Latest in Beauty have in store for us next! 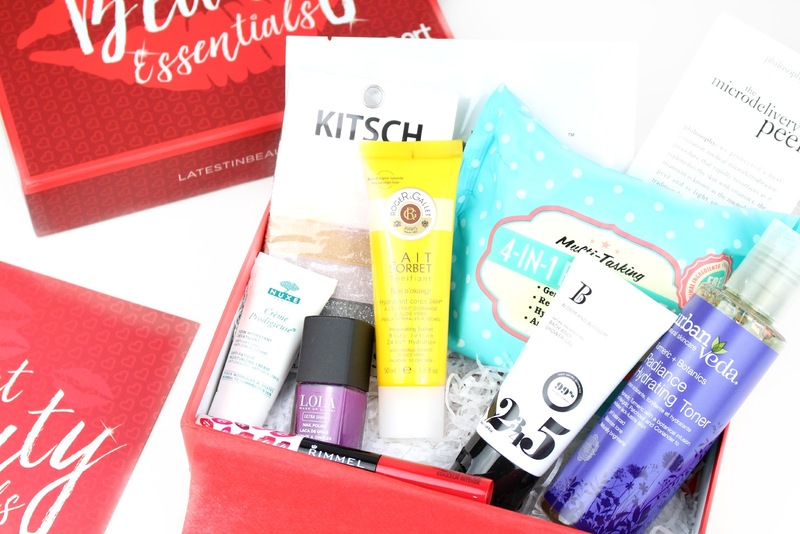 Fancy giving this beauty box a whirl? Well, for £17.99* I think you seriously just can't go wrong - especially as you receive both full size and deluxe sample products from some fabulous brands. If you do decide to give this box a try, don't forget to redeem your FREE P&P with the code HEARTBB15. I hope you all enjoyed this new post and diving inside this fabulous Heart Beauty Essentials beauty box. Like always lovelies, if you have any questions, requests or if you just want a chat you can contact me via my social media or leave me a comment below. I love hearing from you all and I make sure to ready every single comment...they really make my day! What do you think of this beauty box? What was your favourite product featured? I love the hair ties! those kind are all I use now! You got some really great items in this box, I especially love the packaging on those makeup wipes! amazing box if you ask me. Those wipes look adorable, the lola nail polish is so cute and you can never g wrong with a rimmel lippie! oh this is such a fabulous box!!! definitely worth the price, I might check if they ship to the continent to grab it! You got so many awesome goodies in this box! How fun! :-D I love that vibrant and bold Rimmel lipstick! Love this box! It's so happy to get a lip product in the box!